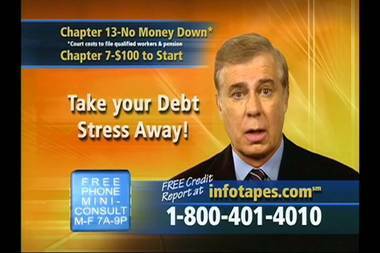 Peter Francis Geraci is well known through his advertising. CHICAGO — The wife of celebrity bankruptcy lawyer Peter Francis Geraci has been ordered to pay $275,000 after a jury decided she assaulted a dog walker in a River North elevator, and not the other way around. Wednesday's verdict came after a lengthy trial with years of testimony pitting the word of Holly Geraci against Robin Di Buono, a 54-year-old dog walker who lives in Humboldt Park. Geraci sued Di Buono and many others in 2014 after a confrontation in an elevator in her River North high-rise, 333 W. Hubbard St. Geraci alleged Di Buono "pummeled" her 20-30 times while holding two leashed dogs in the high-rise, but a Cook County Circuit Court civil jury decided Wednesday that Geraci was the one who got physical, court records show. "I'm so happy to have been heard and vindicated by 12 everyday working people," Di Buono said Thursday. "It was surreal to hear the verdict, and I thought 'how could [the Geracis] see through this when they know what happened." Geraci, a local bankruptcy lawyer well-known for his prevalent TV commercials, did not immediately return a message left with his office manager. Jonathan Parker, a lawyer at Geraci's firm who represented Ms. Geraci, said in an email that his client "was brutally attacked in an elevator in her own building." "The adverse judgment was the result of numerous erroneous rulings by the trial court, and misconduct by the opposing attorney," Parker said. "The judgment will be vacated on post-trial motions or reversed on appeal." Di Buono said she was entering the elevator with two dogs on Aug. 27, 2013, when she was "grabbed from behind" and heard someone scream at her to get off the elevator. She called 911, and when police arrived Di Buono said Geraci was put in handcuffs after walking away from the officers questioning her. Di Buono said Geraci's husband then appeared and threatened to "bring the wrath" of his 80-lawyer firm if she filed charges. "He made a slapping gesture an inch from my face and said 'If you don't drop these charges I will ruin your life and make you wish you were dead,'" she said. Geraci and Di Buono later met with the condominium association governing the tower, and agreed neither would file charges. But shortly after Geraci submitted a report to police, leading to a criminal trial that found Di Buono not guilty in June 2014. The criminal ruling came in the middle of the lawsuit Geraci, who has a lengthy history of litigation, filed against Di Buono and the tower's entire condominium board. A judge later dismissed the condo board members as defendants, court records show. Di Buono filed a counter to Geraci's lawsuit in 2014 alleging Geraci was the one who committed assault. Di Buono produced pictures of scratches on her arms, and the jury Wednesday awarded her damages for pain, suffering, and other emotional distress. Di Buono said she's been plenty distressed. The owner of Chicago Dog Nanny, Di Buono said she's lost business and can't walk dogs Downtown anymore due to the incident. She's suffered from insomnia and "intestinal issues," and was petrified throughout the lawsuit, during which Geraci's team reproduced a plexiglass elevator for the courtroom that she believes sat there solely "for intimidation and psychological purposes." "I can't describe the overwhelming trauma," she said. "I was breaking down and they nearly broke me." Di Buono was represented by Oak Park-based lawyer Tom Bilyk in both her criminal and civil trials. Bilyk called Geraci's testimony in both cases "preposterous." "I wish the Geracis would realize the testimony of Holly Geraci will never be believed by any judge or jury," Bilyk said. The Geracis, who have since moved out of the River North tower and recently acquired an $8.63 million condominium off Michigan Avenue, have a history of prolific litigation against their former neighbors. They sued last year to make the Union Square Condominium Association fix a wall on its roof deck, and filed a similar complaint about dogs in the building's elevators in federal court. Court records show the roof deck lawsuit was dismissed last year, and the federal suit is still pending. In the federal suit, Geraci said she had long suffered from post-traumatic stress disorder due to attacks from people and dogs in enclosed spaces, but her former condo association refused to change its bylaws regarding dogs in elevators. Instead, Holly Geraci alleged the building relies on a "vague" rule saying dog walkers should "acquiesce" to fellow residents' "concerns and requests." "This vague rule, using an obscure word of French origin, exists because the Board of Managers has always been controlled by dog owners, and the Board of Managers, for various reasons, has always enjoyed harassing the Plaintiff," she said in the federal complaint filed last year. Because of the Geracis' history, Di Buono said she never expected to receive her six-figure judgment. "They don't communicate, they litigate," Di Buono said. "They're extraordinarily litigious and have an incredible amount of money."